The family of a man in Íllora went around to the municipal-police office to report that he had been kidnapped. However it was far from the case. The alleged hostage (the father of a family) had not returned home in the evening and had only reappeared briefly at seven in the morning before disappearing again. The family phoned his mobile and it was answered by somebody other that its owner. Furthermore, they thought that they had heard a conversation in the background typical of a kidnapping. So, off they set to report this ‘kidnapping’ to the police with all hell breaking loose. The fact was that the father/husband had been out on the town all night and had left his telephone and wallet in the car of one of his drinking companions. It was one of his equally drunk friends who had answered the phone but had dropped the phone in mid conversation without disconnecting it. It was their incoherent mumblings that had been interpreted as a conversation between kidnappers. Finally the phone ran out of battery. 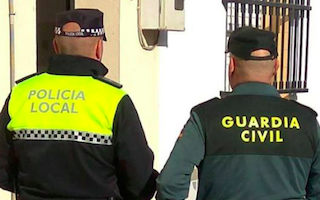 In the meantime, the Policía Local passed on the problem to the Guardia Civil, who in turn launched a search operation which lasted all morning. Then finally at 13.30h they spotted him in the local bar, smashed out of his brains, continuing with the all-nighter. The police took him home to sleep it off. This entry was posted on Wednesday, April 10th, 2019 at 7:53 am	and is filed under Poniente. You can follow any responses to this entry through the RSS 2.0 feed.